Multichannel pipettes are one of the main ways to increase throughput and in turn drive down sample costs especially if you are working with expensive reagents. In The Secret of High Productivity in the Research Lab, Mark Beards stated that life science research is “complex, lengthy, costly, and the failure rate high.” The easiest and most economical way of increasing throughput is upgrading your labs pipettes from single channel to multichannel. Historically, most lab technicians are weary of upgrading to multichannel pipettes because of tip fit issues, weight of the pipette, and accuracy due to limited range. Hence many technicians are still using single channel pipettes today. Fortunately, lab technicians now have a pipette that solves all of those problems allowing them to be more productive and reduce their labs overall costs. The CAPPAero multichannel is the market leaders in increasing throughput and efficiency in the lab. It provides the best tip fit with dual O-ring technology, durable lightweight design with stainless steel aluminum shaft & interior components, and widest range of volumes for best accuracy & precision. 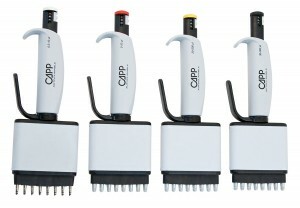 The CAPPAero multichannel pipette can deliver the quantity and quality of results a lab needs. CAPP is a privately owned Danish manufacturing company with over two decades in the liquid handling industry. CAPP is a leader in the market because they have been able to construct a perfectly balanced multichannel pipette with innovative double O-rings (on stainless steel pistons) which keep pipettes tip secure and thus ensure accurate & precise results. Their years of expertise have helped them become the originators of the first fully autoclavable multichannel pipette on the market – the CAPPAero. CAPP is a leader in the market because they have been able to construct a perfectly balanced multichannel pipette with innovative double O-rings (on stainless steel pistons) which keep pipettes tip secure and thus ensure accurate & precise results. A lab doing a high volume of liquid handling research will benefit from multichannel pipettes because of their sheer efficiency. For example, a technician having to do a 96 well has to do this experiment, 96 times with a single channel pipette. Instead, a CAPPAero multichannel pipette can finish this experiment in 8. 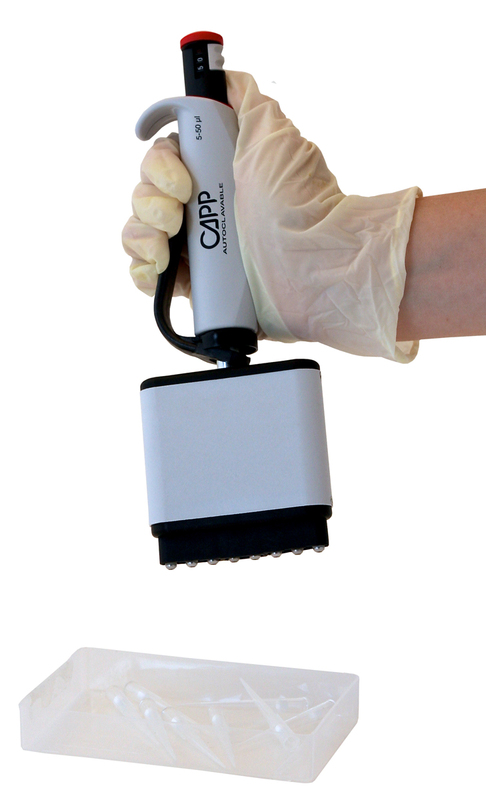 With the perfect weight distribution of the CAPPAero, not only does this decrease the risk of Repetitive Stress Injuries (RSI) but the waste of time, effort, and reagents. 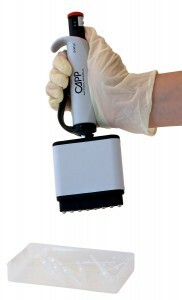 When dealing with a long and repetitive experiment, it is best to choose a multichannel pipette that can diminish the amount of intervals, like the CAPPAero. 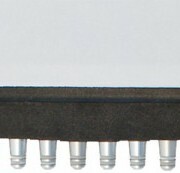 CappAero multichannel pipettes are the easiest pipettes to mount and to dispense any universal tip. The first O-ring creates a smooth seal while the second O-ring creates a positive stop to ensure that the tips are air tight, sealed, and can be ejected with the smallest amount of force due to the trigger engagement. The easiest tip mounting and ejection force ever! The ease of tip mounting also solidifies the CAPPAero’s dependability and ergonomic comfort design. They are designed to be an extension of the technician’s hand as the weight distribution reduces the risk of hand stress. Essentially, the CAPPAero allows lab technicians to pipette large amount of samples within a short period of time while drastically reducing the workload. Essentially, the CAPPAero allows lab technicians to pipette large amount of samples within a short period of time while drastically reducing the workload. The CAPPAero is one of the most accurate & precise multichannel pipettes on the market. When performing an experiment multiple times, if the interior is made out of plastic there is a higher chance that the pipette will decrease in accuracy over prolonged usage. However, the CAPPAero’s interior components are made of precisely manufactured aluminum and stainless steel which decreases the wear of the pipette. In addition, its pistons are made of stainless steel, minimizing the risk of breakage and increasing the accuracy of your results. Accuracy is also met through the wide range of fixed variable knobs that can be detached and locked for further precision, this is beneficial to labs doing repetitive work and less trained technicians dealing with liquids with different viscosity. Furthermore, CAPPAero pipettes come with a 3 year warranty allowing your lab to feel more secure in the precision of the multichannel pipette. Take advantage of CAPPAero’s innovative features and increase your lab’s productivity. 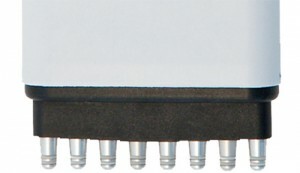 Order your CAPPAero multichannel pipettes today at http://pipette.com/capppipettes! If you would like more information or to schedule a CAPP demo, give Pipette.com a call at 800-243-3232 or email them at info@pipette.com.